is it ok if i y to draw this pic ? I love the color excellent job! That's just the cutest pose I have ever seen. Nicely done with the background as well. 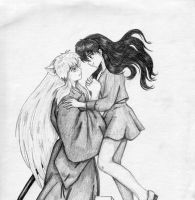 i still cant believe you can draw inuyasha this good >3< anyways awesome pic dude!